Want to improve your form completion rate? Conversational Forms addon by WPForms helps make your web forms feel more human, so you can improve your conversions. Interactive web forms made easy. Form abandonment is a real problem! Majority of users who start filling out your forms leave the page before completing it. Don’t believe me? Just look at your Google Analytics. Now imagine, how many leads are you losing on a daily basis from visitors due to form abandonment? Every day you don’t act to fix form abandonment, you’re losing money. To help you improve your form completion rate, we have created a revolutionary solution: Conversational Forms. 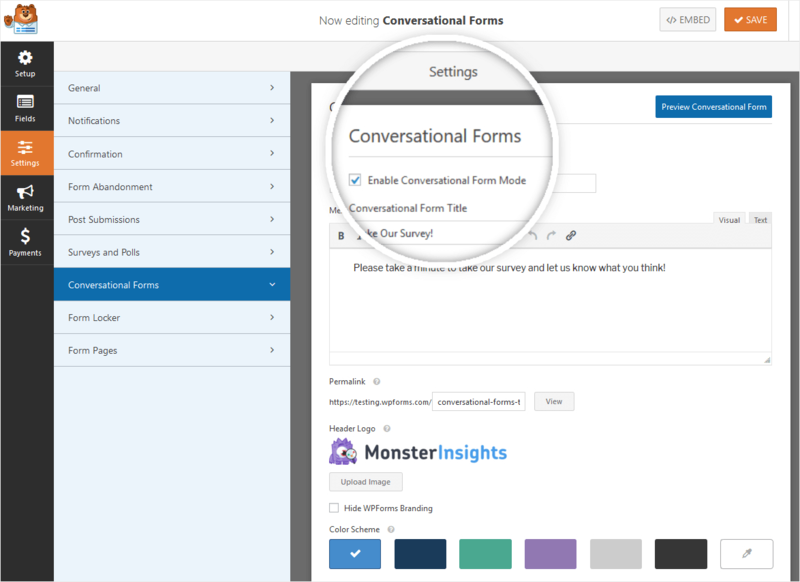 Conversational Forms by WPForms is the first true interactive form layout built exclusively for WordPress that is guaranteed to boost form completion and your overall form conversions. Our goal with Conversational Forms is to help make your WordPress forms feel more human. Instead of asking all twenty questions at once, Conversational Forms takes the one question at a time approach similar to a face-to-face conversation. The full-page conversational form layout makes your form less overwhelming and more personal, leading to a better form completion rate. Similar to our Form Pages addon, Conversational Forms allows you to create a distraction-free conversational form landing page in less than 5 minutes (without writing any code). You can add your logo, choose a color scheme, and pick from different progress bar styles. The best part about conversational form landing pages is that your users can complete the entire form using just their keyboard similar to as if they were having a chat conversation on Messenger. This user experience also works great for smart phones (mobile) and tablets making your forms more accessible for all. Conversational Forms by WPForms is a perfect Typeform alternative for WordPress which gives you access to all powerful form features without the high costs of Typeform. Survey Forms – Instead of overwhelming people with a lot of survey questions, use the Conversational Forms’ one-question at a time approach to improve your survey completion rate. Job Application Form – 60% of job seekers abandon the job application forms because they’re too long or complicated. With conversational forms, you can make your job application forms easy (source). Event Planning Form – As an event planner, you know how many questions you have to ask clients to plan the perfect event. The step by step, one question at a time approach helps you get the data you need without tiring your clients. User Registration Form – Use conversational forms to improve your registration form conversation rate. The best part about WPForms’ Conversational Forms addon is that you can turn any of your existing WordPress forms into an interactive form with a click of a button. And yes, you can use all the powerful WPForms features with Conversational Forms such as our smart form logic, powerful form abandonment addon, marketing integrations, etc. We have literally taken the pain out of creating interactive WordPress forms, so you can focus on growing your business. Get Conversational Forms by WPForms and improve your form completion rate today!